Ever wonder why Happy was always smiling as he whistled while he worked? The Happy life begins at home. Happy�s Hideaway is the perfect vacation "home away from home" where you will enjoy your vacation from the moment you wake up in the morning in your king size bedroom suite...to when you relax in your private screened hot spa and pool at the end of the day. 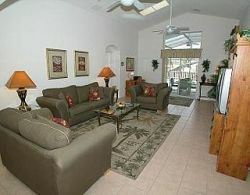 Happy�s Hideaway is located less than 3 miles from Disney World. This larger than life vacation home is fully air-conditioned, and has everything that you could want for a magical vacation, and with 5 bedrooms and 4 bathrooms it is perfect for family groups, sleeping up to 12 guests. The spacious family room has sumptuous sofa, loveseat and chair to help you relax. Sit and watch your favorite movie on, DVD, VCR or premium cable together with the family on the large screen TV. The shaded lanai has a table and 6 chairs. 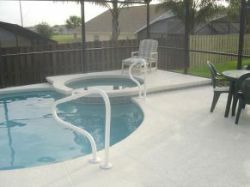 An extra large screened deck with 3 lounge chairs surrounds an over-sized gas heated pool with integral hot spa. Safety rails have been added to the pool for your convenience. 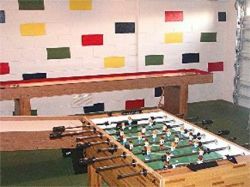 The pool area has a removable safety fence for extra added protection for young infants should you need it, and all doors leading on to the deck area have been provided with additional safety locks and alarms. Sleeping accommodations includes 3 master suites and 2 twin bedrooms. Two master suites have king size beds and spacious en-suite bathrooms, and direct pool/spa access. 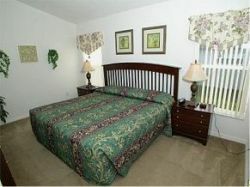 The 3rd master has a queen size bed and an adjacent bathroom. Each twin bedroom has 2 twin beds. All bedrooms have dressers with mirrors, night-stands, lamps, closet space and in-room televisions and bedside clock radios. The bright and airy kitchen has been equipped with almost everything that you could need to cook that fabulous family feast or a quick snack. The kitchen nook has seating for 6 and the adjacent dining area has a full sized table with 6 cushioned chairs. A snack/breakfast bar has additional stool seating for two. Rounding out the amenities is a private laundry room and a family game room.